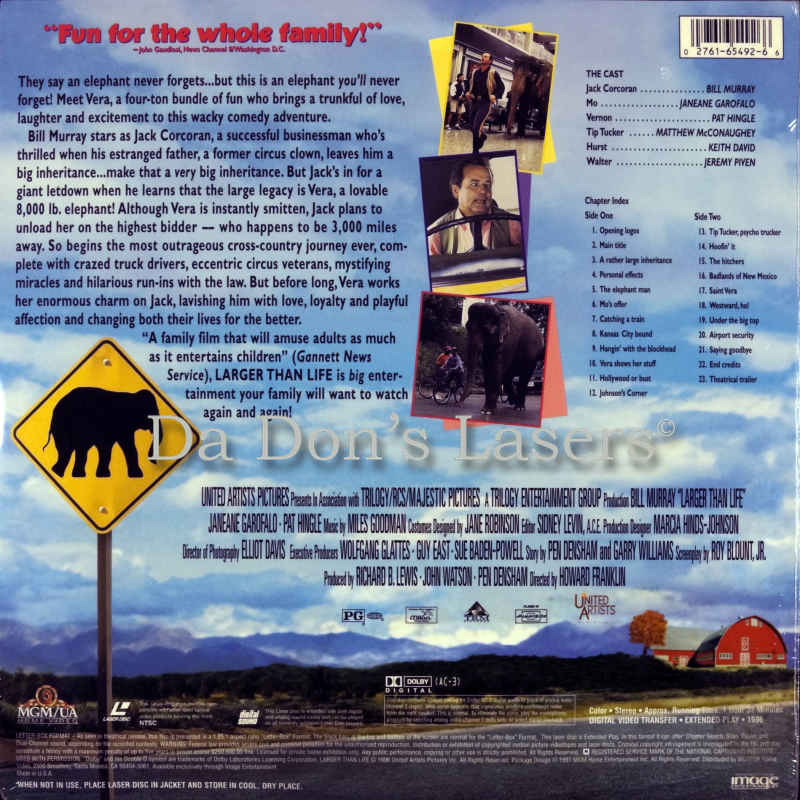 Larger Than Life 1996 - 93 min. 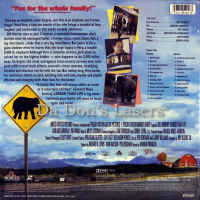 - Color Genre: Comedy Rated PG Country: USA LaserDisc Movie Storyline: When Jack Corcoran's dad -- a circus clown -- dies, he leaves his son two things: a huge pile of debts, and a very large elephant named Vera. In order to pay the debts (and for other obvious reasons) Jack decides to sell Vera. The only problem is, the pair must travel cross-country to reach the people willing to purchase the pachyderm! The result is an unusual, event-filled, hassle-laden adventure, that Jack will NEVER forget. 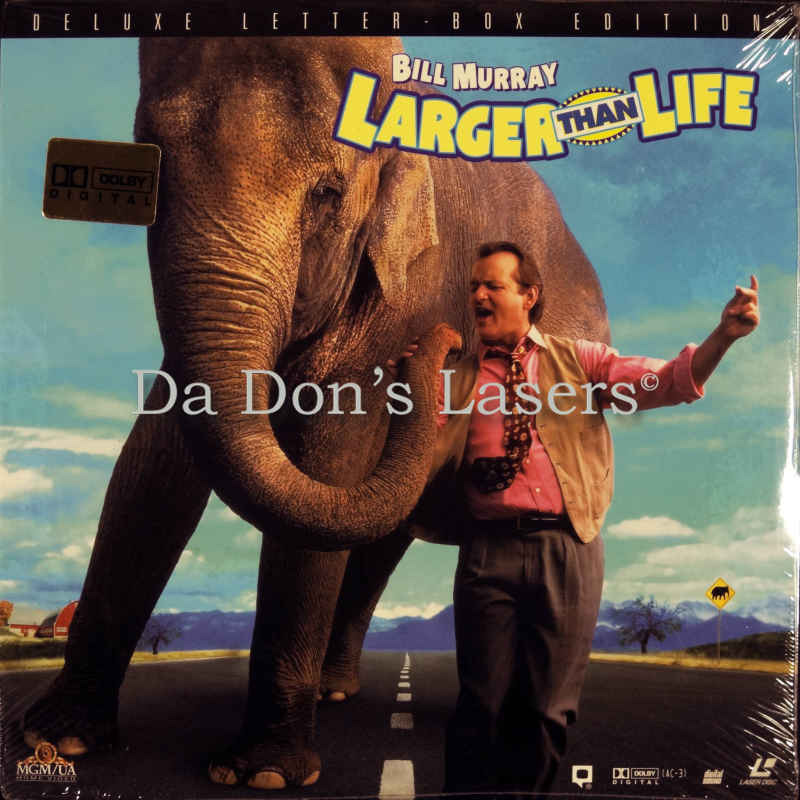 LaserDisc Movie Review: Bill Murray teams up with his biggest co-star to date (with the exception of the Stay-Puft Marshmallow Man) in this family-oriented comedy. Jack Corcoran (Bill Murray) is a motivational speaker who makes his living advising others how to tie up the loose ends of their lives, but he has plenty of his own left dangling. Jack is emotionally at the mercy of his mother (Anita Gillette) and his fiance Celeste (Maureen Mueller), while his booking agent Walter (Jeremy Piven) keeps promising him bigger and better things that don't materialize. Jack has grown up believing that his father died before he was born while trying to rescue a drowning child, but he learns that was not the case at all --- Dad spent a long career working as a circus clown, and died only a few weeks ago. However, Dad was kind enough to bequeath Jack a large stack of debts and his only tangible asset, an Indian elephant named Vera (Tia). Jack is in no position to keep a pachyderm at home, and he has two options for getting rid of the animal --- sell Vera to Terry (Linda Fiorentino), a mean spirited animal trainer, or donate her to Mo (Janeane Garofalo), a zoologist who hopes to return her to the wilds. Either way, Jack has to get Vera from the East Coast to California, and in order to make an important speaking engagement, he and the elephant have five days to cross the country. Larger Than Life also features Matthew McConaughey as an excitable truck driver; Keith David, Harve Presnell, and Pat Hingle also highlight the supporting cast. --- Mark Deming A few genuinely funny gags and a great opening sequence don't add up to a comic masterpiece in this lumbering farce starring Bill Murray. The concept of the laid-back, witheringly sarcastic Murray as a motivational speaker trying to transport an elephant across America should be a lot more humorous than this, but the audience is treated to only a trio of guffaw-inducing scenes involving a human pyramid, an out-of-control truck, and a salad bar. The rest of the time, the film unfolds like an unfunny Saturday morning special for children, with actors as diverse as Janeane Garofalo, Matthew McConaughey, and Linda Fiorentino appearing in small roles that are a lot more irksome and goofy than hilarious. It's all handled with such a languid, meandering pace that, despite its occasional charm, Larger Than Life (1996) never displays much of a pulse, its energy sagging for long portions and its sluggish plot dully winding down instead of ending with a big flourish. --- Karl Williams Thanks for Visiting DaDon's Rare LaserDiscs ! Reviews, Articles, Newsletter and Information for Movies on LaserDisc LD Laser Disc, LazerDisc.